In some environments, it’s a buzzkill. The new Sontec Co., Ltd., RFID transponder features high read-range performance to facilitate supply chain optimization for consumer goods suppliers of appliances, electronics and products with high metal content. DALLAS, Oct. 10 /PRNewswire/ – Radio frequency identification (RFID) technology for ultra-high frequency (UHF) application and metal products or environments complement one another about as well as oil and water, making RFID-enabled retail supply chain (RSC) management of metal goods a difficult challenge. Sontec Co., Ltd., a leading Korean developer and manufacturer of RFID components and middleware, today announced the availability of various types of mount-on-metal tags and its RFID transponder for metal, which is based upon EPC Gen 2 integrated circuit (IC) chips from Texas Instruments Incorporated (NYSE: TXN – News; TI). The new RFID transponder features high read-range performance to facilitate supply chain optimization for consumer goods suppliers of appliances, electronics and products with high metal content. To date, TI has shipped 10 million Gen 2 chips to Sontec, who will continue to source chips from TI. Sontec will initially target sales to white-goods and electronics manufacturers in Asia, though ultimately, the manufactured products will ship to global retail markets including Japan and the U.S. Traditionally, the radio waves emitted from an RFID tag are reflected by metals at ultra-high frequencies and weakened by the eddy currents metals produce. This effect reduces read-range performance and renders the tags less effective in retail supply chain applications where read distances of 10 to 30 feet are required. TI recently announced the availability of the EPCglobal(TM) certified Gen 2 UHF IC chip used in the Sontec tag. Offered in wafer and strap form factors, TI has developed its Gen 2 silicon on the most advanced analog process node at130 nanometer and a built-in Schottky diode for more efficient conversion of RF signal energy, resulting in chips with low power consumption and increased chip-to-reader sensitivity. Texas Instruments is the world’s largest integrated manufacturer of radio frequency identification (RFID) transponders and reader systems. Capitalizing on its competencies in high-volume semiconductor manufacturing and microelectronics packaging, TI is a visionary leader and at the forefront of establishing new markets and international standards for RFID applications. For more information, contact TI-RFid(TM) Systems at 1-800-962-RFID (7343) (North America) or +1 214-567-7343 (International), or visit the Web site at http://www.ti-rfid.com . Sontec Co., Ltd. is a high-tech Korean company that specializes in the development and manufacturing of RFID components and middleware. The company has developed an extensive line of RFID components that support the deployment of RFID-based solutions in industrial and logistic-intensive environments. 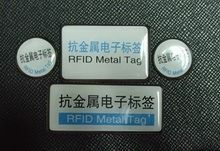 These components include EPC RFID metal tags based on copper, silver and electronic ink technologies, antennas, car-sticker tags, access control/ID- cards, handheld readers, and middleware. For more information, visit the Web site at http://www.sontec.co.kr . TI-RFid is a trademark of Texas Instruments. All other trademarks and registered trademarks are property of their respective owners.